Longmire returns for its fifth season on September 23, and there are a few stories fans of the series are curious to see where they might go. 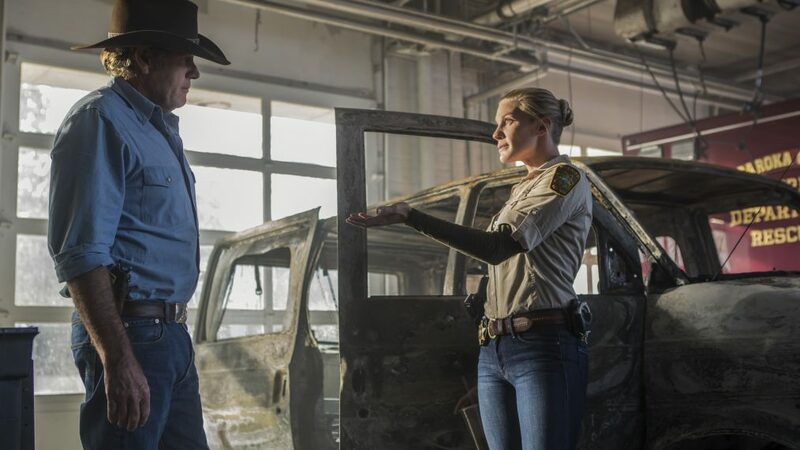 First is the budding attraction between Sheriff Walt Longmire (Robert Taylor) and his deputy, Victoria "Vic" Moretti (Katee Sackhoff). Vic expressed her feelings to Walt at the end of Season 4, but Walt told her that he wasn't available in that way. As the exclusive shot above shows, though, the two of them still have to work together, and the attraction between the two won't die down anytime soon. Meanwhile, Henry Standing Bear (Lou Diamond Phillips) is living a double life with an assumed identity; when Walt becomes aware of his friend's second identity, the bromance between them gets strained. In the exclusive pic below, Henry is confronted by casino owner and tribe power broker Jacob Nighthorse (A Martinez). Longmire, Season 5, streaming on Netflix starting Friday, September 23.